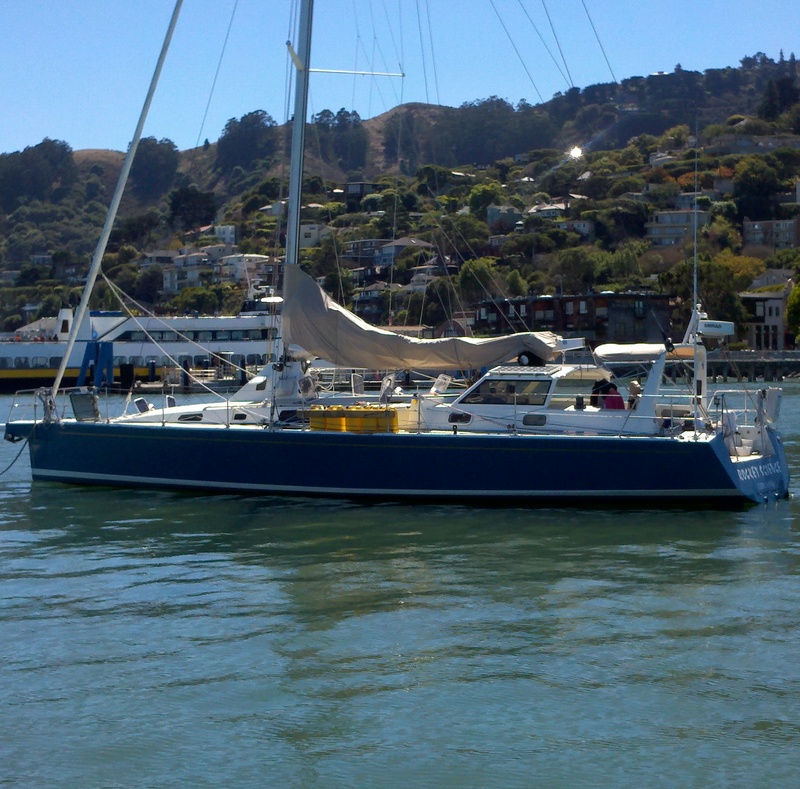 We are sailing from San Francisco Bay to the Channel Islands this summer. Aside from working on the to-do list and planning is to take pause from preparations and spend time reading Bernard Moitessier. The French-Vietnamese circumnavigator’s maritime narrative reads as lyric verse and Farmers Almanac guidance. Clutter can accumulate within the mind while preparing a sailboat. In this modern era there is the risk of having too much equipment. Electronic navigation has radically changed the task of keeping an accurate course and position. Automatic Identification System-allows two vessels to view the others information while approaching and take evasive action or as needed to hail by VHF radio. Add the weather satellites and telemetry from the ocean buoys being caught offshore in an unexpected gale is much less common now than in earlier times. Moitessier reads more as an example in how to exercise judgement. He nudges less seasoned mariners to unloading expectations, Turn the keys to your life over to the seas rhythm and wavelength. Be with the wind and the waves. Listen to the music of the bow wake. Technology can veil the visceral, anxiety can turn attentions inward, the long list of things you didn’t get done before shoving off can distract. We untether from a land based time and begin living on that other scale on the inner clock. Nothing much happens when sailing resembling the pace of the modern world. You become acquainted with the pace and rhythm of the clear and present. Here and now with hundreds of miles ahead asks the voyager to get comfortable in their own bones. Impatience, the odd pace of life at sea, unrealistic expectations will contaminate the mind and fog the lens of judgement. Exercising untainted judgement is the highest form of voyaging art. The best decisions determine whether you and your boat will both live to tell. Buy a book, book a show, and be sure to come back for no good reason other than to have a look-see. I’m right here mate. A full week ahead. Saturday at Harvey Milk’s Civil Rights Academy in San Francisco. More LA in the mix. A big shout out to the heroic work underway on our behalf and for the sake of this experiment in life, liberty and the pursuit of happiness. You don’t want Sally Yates or Stormy Daniels feeling like you aren’t leveling with them. You cross them at your own peril and it seems that one rather prominent man in a position to know better has done just that. One of my missions is to give voice to what being in California feels like. What is this experience doing to its citizens? What’s happening? What’s this happening happen to feel like? One thing for sure you better plan on driving off hours when everyone else has gotten to work and be sure to be done driving before everyone starts driving home from work. The freedom to move about in California is neither absolute or during much of the day practical. Driving from LA to Phoenix off hours is infinitely easier than tangling with rush hours. I am back up in San Francisco this weekend. I’ll spend Sunday with two of the great men of Boston’s street theater scene. 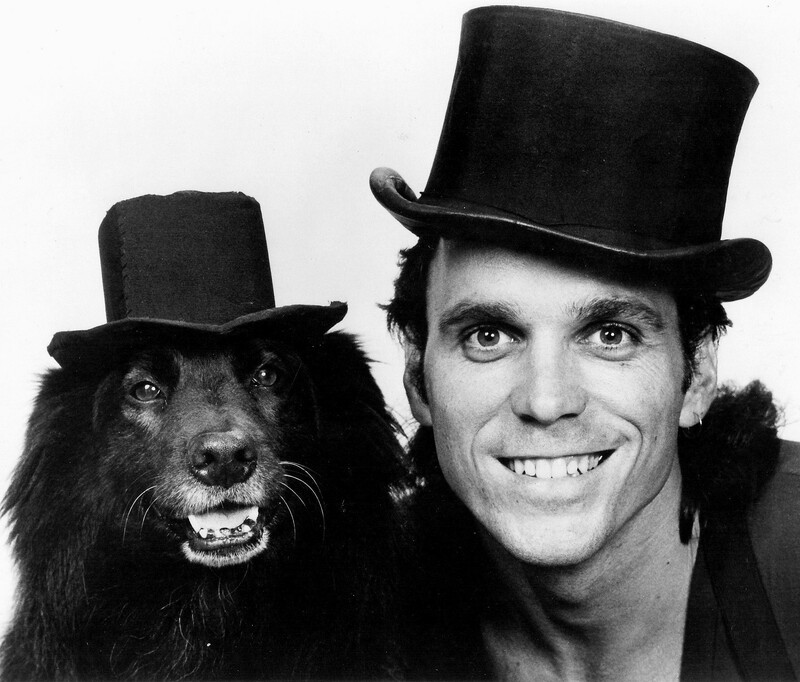 Steve Aveson and Al Krulick were The Shakespeare Brothers. I was a cousin working not in but along side. Al is out here on the west coast and we’ll debrief the raging sage of Binghamton, New York. I’ll also get a chance to sound off about the World Emergency Full Catastrophe Climate Change Comedy Show. This talented duo will be a fountain of misguided comic gold to return to the invention laboratory where I will continue my explorations. What is tougher than Charles Bronson? And here another piece in the preparation of sailing offshore in California this summer. One fully loaded Ford Navigator can be suspended by this line.. Dyneema is rope’s real world version of the comic book fantasy world’s Kryptonite. Technology marches on and in the world of sailing the proliferation of new materials is mindboggling. Whether entertaining, sailing or writing a novel you had better come prepared to weather the challenge. Now away… more soon… come back as you can. Rocket Science a mini-monster from the Cook Islands. This is 50 feet, water ballasted, twin ruddered, carbon fibered, wickedly fast boat with a 13 foot draft!!!! I stepped aboard a monster Sunday. The beast tethered to a dock. Sixty-five feet of ocean going, purpose built, go anywhere, under any conditions sailboat. The beast had been born inNew Zealandto an American couple. For eight years this water ballasted ballistic sailing vessel was both a means to an end and an end in itself. The design was conceived with a lengthy and sleek hard dodger. The stick was massive, the spreaders gargantuan, staysail could be hanked on, and the jib roller furled. Temporary lower backstays were ready in the event the staysail was deployed. Oversized winches were aft, a weight compromising windlass on the bow (looked more than adequate for the job while small enough not to interfere with the boats sailing characteristics.) And I have to mention the spinnaker pole stowed vertically against the leading edge of the mast. A mere man and woman, two people handled the task of sailing this unrelenting powerhouse. Losing control of a boat this size, flogging a sail, jamming a line, getting a sail down, hoisting one up, furling an unfurled sail, or having the guts to unfurl the thing was akin to going into a war zone voluntarily. At the center on the starboard side below a diesel heater had been installed. There was a huge generator, a larger still auxiliary diesel. Forward in the V berth a queen sized bed. 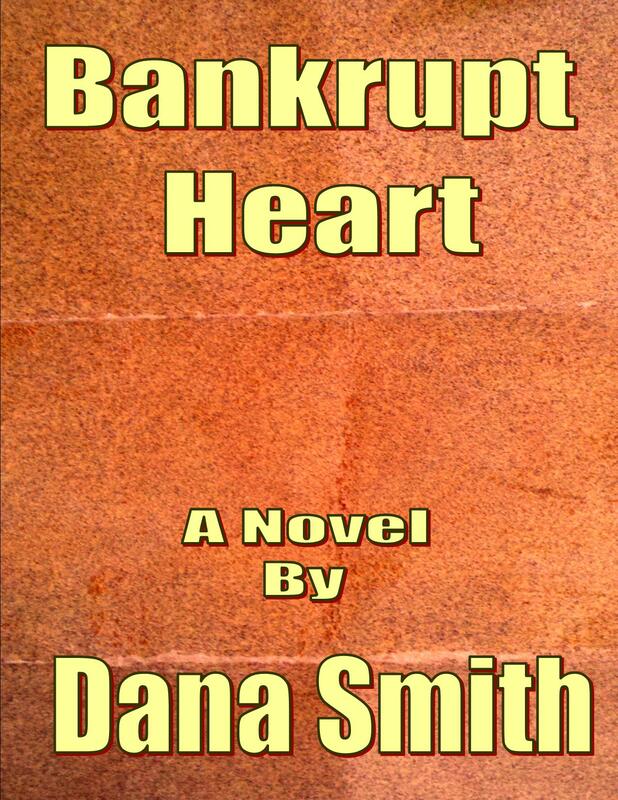 The boats interior was not Spartan, but its purpose was the point. Navigation, cooking, electronics, the heads, showers, rear stateroom, the interior lighting, portlights were all what you would expect of this one of fiberglass Titan. I was imagining the able bodied seamen I’d want with me should I’d found myself heading out the Gate on an ebb in a blow. I’d pick a couple of old coots the balance would come broad shouldered, under forty and be either crazy or have guts, preferably both! In 2003 I was down inFt.Lauderdale. Wandering the docks I stumbled upon a brokerage that specialized in selling sailboats of this size. They were all beasts. You looked at one and said I could take that boat right now to Europe, that other up the Northwest passage, still another toAntarctica. There were a few tender looking boats mixed among the toughie’s, and then there was this one I was aboard yesterday. It is something special to be aboard something that resembles what you would use to get you through your worst nightmare. It is something like how you would travel to somewhere over a rainbow intent upon arriving back from a dream you would be wise not to make. 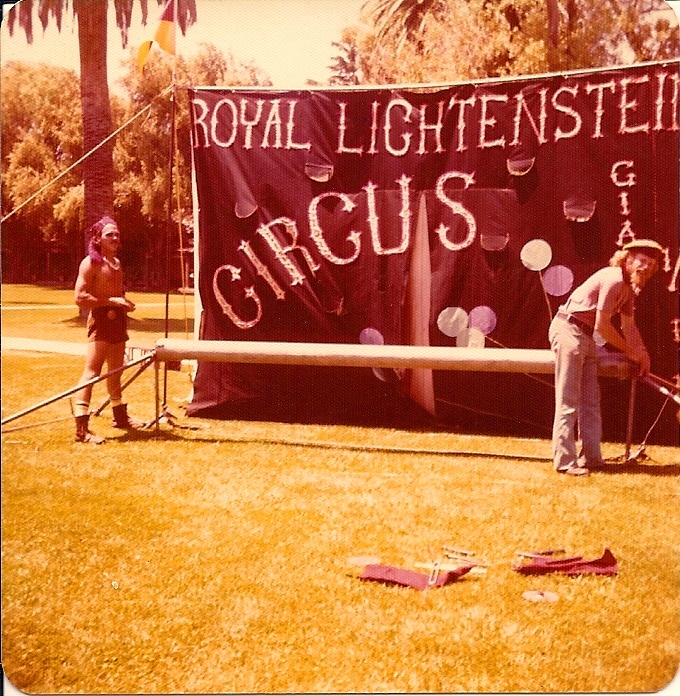 My beginnings as an entertainer started in 1974 with the Royal Lichtenstein Quarter-Ring Sidewalk Circus. I am on the left and Nick Weber the shows creator is on the right. 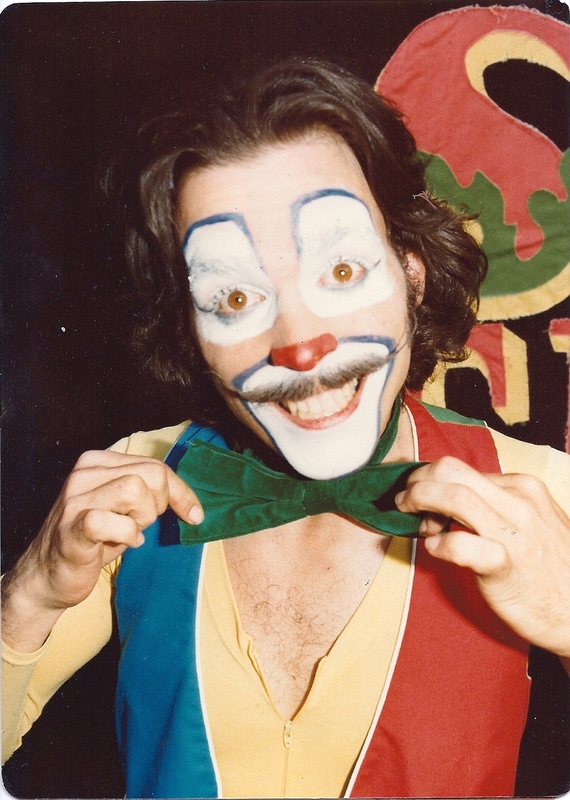 After a year long national tour with the circus I struck out on my own. Sold my motorcycle and bought my 1967 Ford pickup and packed my first show into the back of that truck and set out on a six year non-stop tour. I learned to go north and south with the weather. 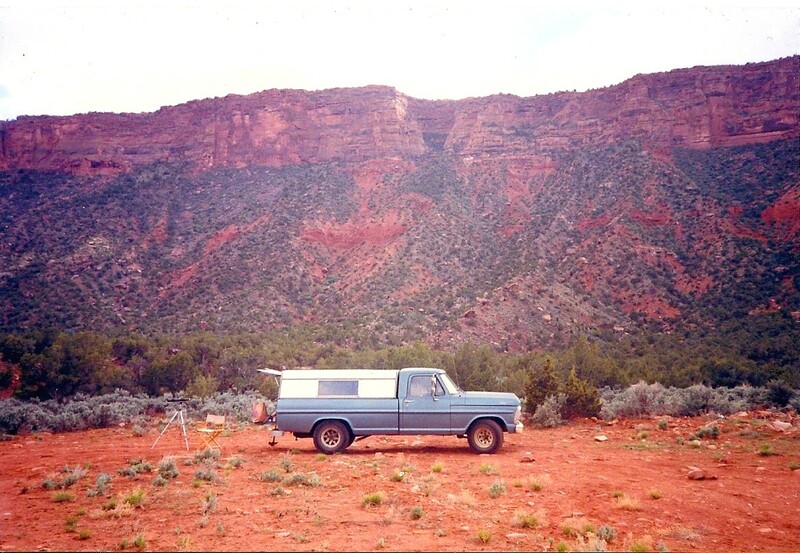 I learned to live out of my pickup truck, how to get book dates for the show, where to park and sleep, find showers, make telephone calls, cook of a tailgate, fix the truck when something broke, and to pursue with passion my vision of what my life should be. 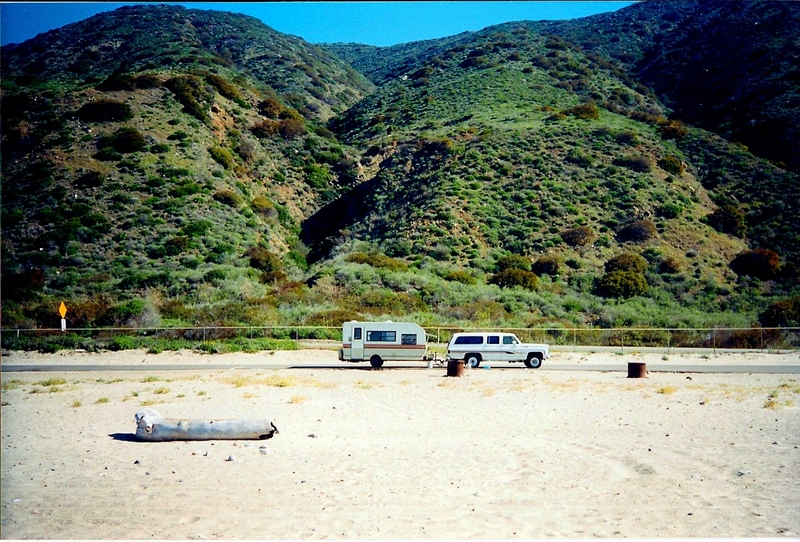 telephone answering service I arranged for back in California. I would check for messages with the service and then set up and pay a small fortune in coins to contact future clients, friends and family. next. Put about two hundred thousand on this rig. Next came my Dodge Cummins diesel dually. And at present I roll with a 2007 Toyota Tacoma 4 cylinder 5 speed stick, twenty-seven miles to the gallon rig. purity of the best parts of who I was until accounted for. This is to say that nobodies perfect and I express and honor my flaws and speak up with some candor for trying to address those now. So, this short narrative explains in capsule form where my experience comes from. It explains what work I’ve done and where and where I haven’t lived. At present I am planted firmly in the hills of the East Bay near San Francisco. Waiting in the garage my trusted Toyota and nearby in Emeryville our trusted sailboat. I am less urgent at the moment about going out on the road or heading out to sea, but the day will arrive when I’ll want that and seek out the opportunity to go, ride the wind across prairie or sea, and find out what else I can know about this world we live in. Early this morning atop Las Trampas Peak in the EastBay hills here in San Francisco Bay Area a storm approached off the Pacific. The storm produced wind gusts to Force 10 on the Beaufort scale. Quoting from the scale, “Very high waves (20-30 ft) with overhanging crests, sea white with densely blown foam, heavy rolling, lowered visibility.” And what does it say about land? “Seldom experienced on land, trees broken or uprooted, considerable structural damage.” The wind ranged from Force 7 with gusts to Force 10. Sailing in the bay or just offshore it is important to remind ourselves that when a weather system moves toward the coast that it is wise to head into the safety of port while the system passes through. Some sailors prefer to remain well offshore and ride out the system as it passes. Last night it was a rather brief 3 hours that the most intense winds blew. 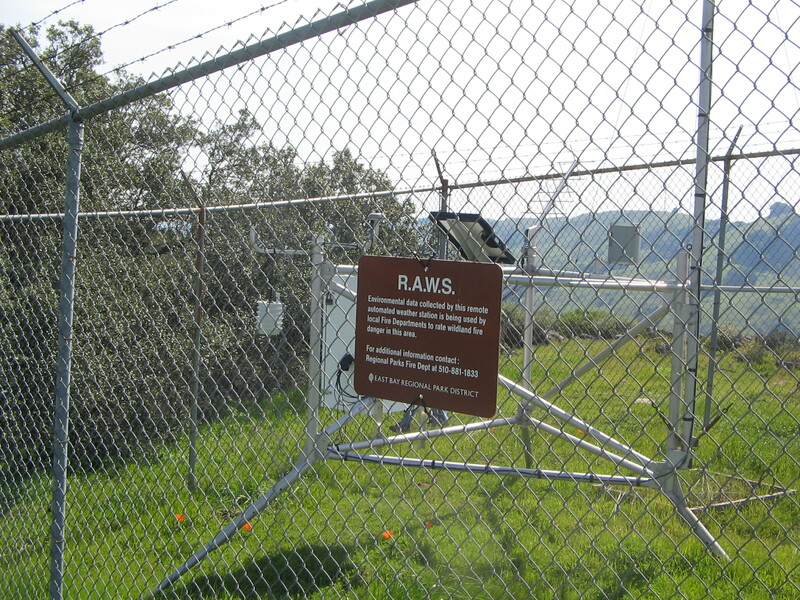 Here is the link for the East Bay Regional Parks remote weather stations. You can click on the various stations and get up to the minute, real time information about wind speeds, gusts, temperature, rainfall and a few other details. 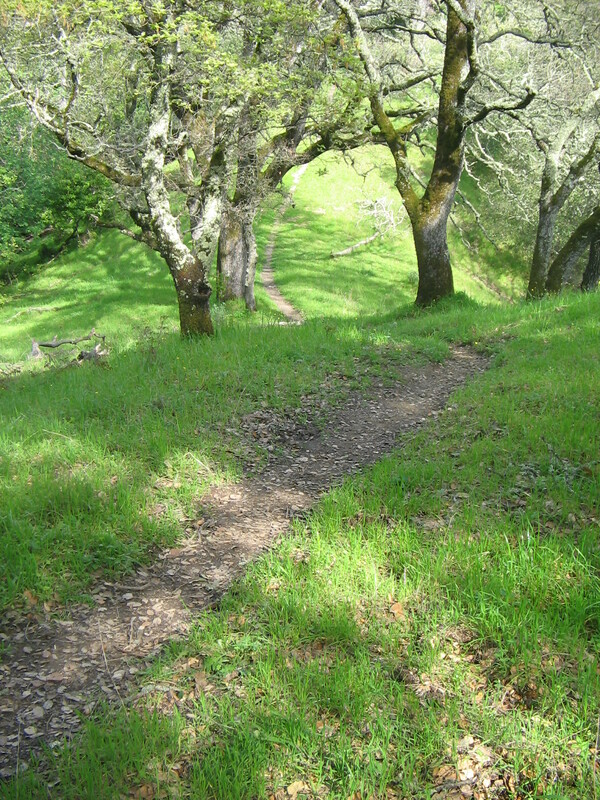 http://www.ebparks.org/about/fire/raws Our home sits at 900 feet above sea level while Las Trampas sits at 1760 feet. We factor in our lower elevation while reading the data from the peak. I cross reference this data with the National Weather Service’s buoy data. The San Francisco buoy #26 http://www.wrh.noaa.gov/mtr/buoy.php (SF entrance buoy about 12 miles offshore…)showed that at midnight there was a high wind speed of 27 knots from the south. An hour later atop Las Trampas Peak it was steady at 38 knots and gusting to 51 knots and a wind direction out of the south. Approximate elevation differences account for the higher winds. Our home is set atop a ridge and when a southerly howls in from off the Pacific there is nothing to blunt the full force of a storms impact. Looking at the buoy report the waves as the highest winds passed were described as very steep. These very steep waves for small craft out on the coastal waters last night aren’t just a data point, they were an experience, a story to tell, a story some sailor is likely to be grateful this morning to have the good fortune to have found at sunrise his boat is whole and he has lived to tell. He walked up the gangway and into the parking lot. so light it ignored the pull of gravity. He walked along the bank of the canal. had found its way back into the center of his mind. 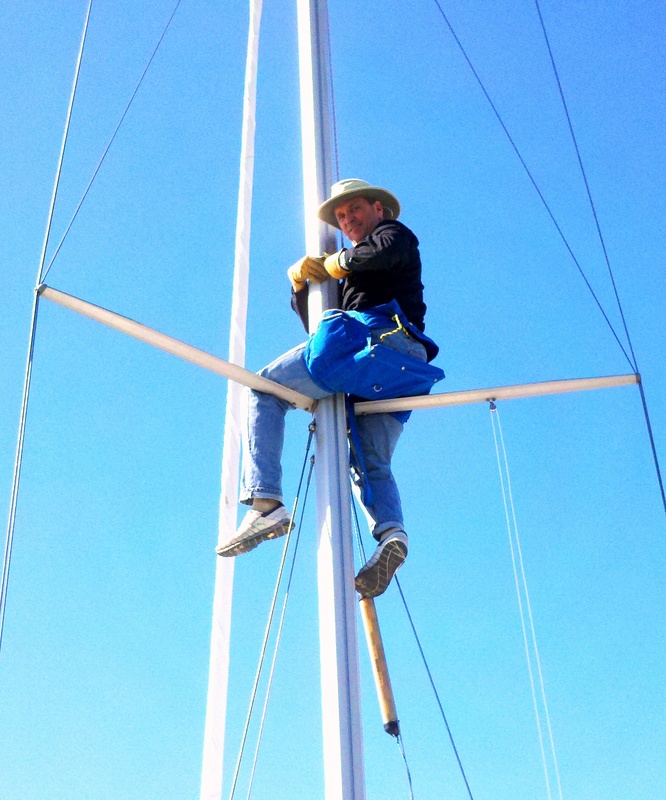 Fear of change comes into view when it requires hoisting up a mast of a sailboat to change a light bulb. The mast on this Jeanneau sloop measures 45 feet from the deck. One person goes up the mast to do the work while a second is depended upon to winch the worker both up and then back down safely. Fear and trust are not intellectual when doing this work. Fear doesn’t seem to be located in the mind although it does seem to clutter it. It seems out of the mind and in the body where it advertises its presence…slight shaking, sweaty palm, rhythm of breath. When looking aloft from the first spreader to the next spreader and then from there up to the top of the mast I get the opportunity to stare right into the jaws of my instincts. Then, as if a symphony is playing my mind becomes orchestral…heart is timpani…hello gut it says, are you sure you want to do this? Yes, I am sure. I don’t want to do this. People who tell me they are bored, that nothing ever happens to them. Have I got a cure for you….